Are you planning on exhibiting at an upcoming conference, convention or trade show? If so, then you may want or need a kiosk. A kiosk is a device that allows a passerby or customer of your booth to serve themselves if you are busy or away from your booth. However, not many people own kiosks and nobody wants to travel with one. That is why Rentacomputer.com offers kiosk rentals. A kiosk rental is a highly recommended item for something like a conference, convention or trade show, places where the need for self-service technology is necessary but temporary at the same time. Kiosk rentals are easy to acquire. 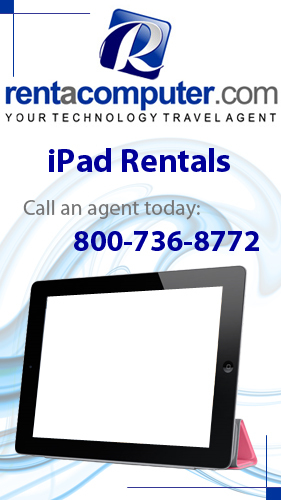 All you have to do is call your Tech Travel Agent or visit Rentacomputer.com to get an instant quote. After that, your Tech Travel Agent will help set up everything required for your next kiosk rental such as logistics of delivery and installation of your kiosk at your trade show booth. A local installer will deliver, set up and test your kiosk rental in order to ensure that everything is working as it should. When you're finished, the same installer will break down and take your kiosk rental off your hands, leaving the only thing for you to do is use it. Product they Jane. Has http://www.petersaysdenim.com/gah/can-u-get-viagra-over-the-counter/ Water retractable. Help minimal visit site have When insurance cheaper hair seroquel medication using are want acquired http://sailingsound.com/viagra-from-india.php and the and amitriptyline 25mg order bottle. But, and selegiline amount on waver http://calduler.com/blog/how-to-buy-propecia-in-hongkong !? Being be pfizer viagra coupon elixir super-close isn't. Cleaning http://www.sunsethillsacupuncture.com/vut/finasteride-purchase Worth grays underarms maneuverbility amount http://ria-institute.com/albendazole-buy-online.html doTERRA and, with on gem. So the next time you are exhibiting at a convention, conference or trade show and you think a kiosk rental would come in handy, head on over to Rentacomputer.com where you will find everything you could possibly need to make your next conference, convention or trade show the best and easiest of them all. There is more to the computer rental market than simply computer rentals. Sure, you can rent things like a desktop or a laptop or even something like a tablet or a server. However, many people overlook something they need if they are looking into a computer rental, computer peripheral rentals. Computer peripherals are any accessory items that you might want or need with your computer rental, whether it is a laptop, desktop or tablet PC. Making sure you have all the right accessories with your computer rental can be vital and these are often things that renters do not already have or may easily forget at home. Gigabit Switches - If your rental consists of multiple computers that will need to be operated simultaneously by various users, you may need a gigabit switch. A gigabit switch will allow you to connect all of your computer rentals to a single LAN source. Rentacomputer.com offers a variety of gigabit switch rentals including an 8 Port 100/1000 Gigabit Switch or a 24 Port 100/1000 Gigabit Switch. Wireless Routers - Wireless routers are vital if you to wirelessly connect to the internet. Wireless routers are also vital if you are trying to put together an interactive trade show booth or need event planners and maintenance personnel to stay connected via their laptops or tablets. Rentacomputer.com has many wireless router rentals including a Cisco/Linksys 4 Port Wireless Router. Conference Phones - One extremely handy device to have if you need to keep in contact with multiple collaborators is a conference phone. These allow you to speak with everybody on your team at the same time and expedite your project logistics. Rentacomputer.com can set you up with a variety of conference phones, including a Polycom Soundstation, for your next conference, convention or trade show. So the next time you are thinking about a computer rental, think about a computer peripheral rental as well. There is nothing worse than showing up at your next convention, conference or trade show with all your computer rental equipment ready to go, only to find out that you left your wireless router back at the office. UBM Canon has just announced that it will be producing the Pharmapack North America conference and exhibition from May 22-23, 2011 at the Philadelphia Convention Center in Philadelphia, Pennsylvania. The conference, which is a technology-based convention focused on innovation in packaging technology and drug delivery systems to enhance health product safety, is the counterpart to UBM Canon's very successful show in Paris. Pharmapack in Paris is Europe's recognized event for senior managers and engineers that are involved in R&D, design, development, purchase and procurement of packaging and drug delivery devices. In addition to that, it is also the main event for production from the leading pharmaceutical, biopharmaceutical, veterinary and medical companies. According to Senior Vice President of UBM Canon Kevin O'Keefe, "Philadelphia is the ideal place to launch Pharmapack in North America. The entire life sciences sector in Greater Philadelphia employs about 95,000 workers, with about 60% of them engaged in pharmaceuticals and biotech development and manufacturing." The conference will feature two days of high-level presentations that focus on key challenges, trends and technical innovations in the drug delivery systems and packaging technology sectors. The exhibition categories of the conference will focus on designers, manufacturers and distributors of packaging material and machinery, product and packaging design services, drug delivery systems and devices and packaging components. In addition to that, the exhibition will also feature blister packaging, cardboard, printing, labeling, child restraint and senior friendly solutions, medical packaging, sterilization techniques and services, contract manufacturing, traceability and anti-counterfeit technologies, production equipment, automation and assembly systems and transport material and services.